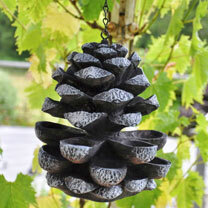 Made from strong plastic resin, this lightweight and unique bird feeder features pine cone scales that are shaped like small bowls to hold bird seed. Natural and realistic, it comes complete with hanging chain and hook. 18cm diameter x 22cm high x 18cm width.